There are few authors more revered among bibliophiles than Jorge Luis Borges, poet, philosopher, and director of the Biblioteca Nacional de la Republica Argentina. So when a Borges manuscript appears at auction, we take note. On March 27, Bonhams in London will offer this three-page autograph manuscript signed of Borges' prologue to the Spanish translation of Ray Bradbury's Martian Chronicles (Ediciones Minotauro, 1955). Yes, Borges devotees will have to bid it out against Bradbury buffs for this piece of literary history, in which Borges writes: "What has this man from Illinois created - I ask myself, closing the pages of his book - that his episodes of the conquest of another planet fill me with such terror and solitude?" 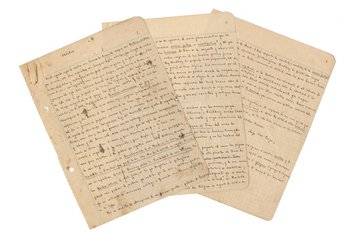 The manuscript comes to auction from the family of Ediciones Minotauro publisher Francisco (Paco) Porrua. In this case, Porrua was also the book's pseudonymous translator. It is estimated to realize £6,000-8,000 ($7,900-11,000).